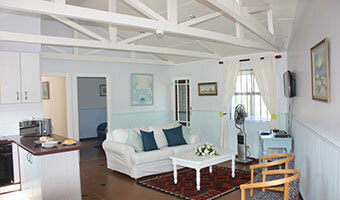 Many people choose to make their Cape Town holiday more affordable and more enjoyable by booking self-catering accommodation in preference to a hotel or B 'n B. You will find that Horizon Cottages' affordable self-catering accommodation will meet all of your needs, from a family holiday, a romantic weekend away or even on a business trip. 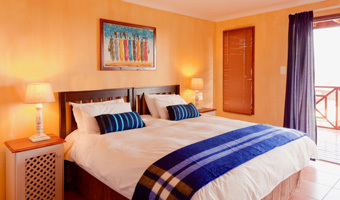 Here are some of the reasons to choose self-catering holiday accommodation. Economical: The cost of eating in hotels can be prohibitive for many families because of the general rule of marking up what they serve by 300%. Enjoying your holiday in one of our self-catering cottage or chalets gives you the freedom to buy whatever you wish to eat or drink at competitive prices from a choice of local supermarkets, all within a few minutes of our accommodation. We are well served by franchise restaurants and takeaways in the malls which are within walking distance so that, even if you do not wish to cook, it will be economical for your family to eat in. During holiday time kids expect snacks and drinks more frequently than when at home and our fully equipped kitchens will allow you to keep a range of healthy snacks and drinks for them, purchased from the local supermarkets. Not only will this work out cheaper but you will not have to constantly fork out money for tips for waiting staff. Enjoying a glass or two of wine at sunset on one of our stoeps becomes an inexpensive treat. Self-catering does not mean that mother has to cook all the meals; some nights you may choose to visit one of two local food markets held in the middle of the week which offer our guests the opportunity not only to feed the family on a range of inexpensively priced home prepared meals and delicacies but will also enable them to enjoy the stunning Noordhoek views that they offer, while the kids run and play and make new friends. Staying in our self catering accommodation gives you the opportunity to sample new food and dishes. Dad can also take over and have fun with the family at the private braa/bbq provided for each accommodation. This sure beats having to sneak food up to your hotel room. Some may have a special dietary requirement, either from a health or a cultural point of view , which you will find it difficult to have attended to in a hotel or a B 'n B. Not only will you have total freedom to meet these needs, but to eat at any time that you wish. When on holiday in our family friendly cottages our guests often find that younger children want to eat at different times to the adults; not easy to arrange in a hotel. Spending a day at the beach or on the mountain seems to stimulate the appetites. New Experiences: one can be tempted, when staying in a hotel, to visit the local restaurants to eat within a short distance of the hotel, whereas your stay at Horizon Cottages can be much more exciting and interesting by making use of the local knowledge that we have, including where to get the best value for money and where to find the specials. Noordhoek and the surrounding suburbs of Fish Hoek, Kalk Bay and Kommetjie offer a wide variety of choice ranging from budget eateries to fine dining- don't forget the delicious fish and chips for which Cape Town is famous and which can be enjoyed at many sea-side eateries, literally for take away prices. As locals we enjoy being able to advise our guests on where to eat out in restaurants that they might not otherwise have been able to find. 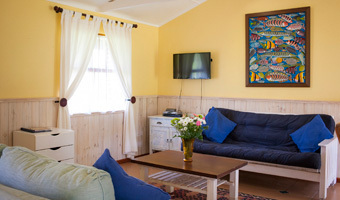 Spacious: The main advantage of self-catering holidays in Cape Town is not only that you can come and go as you please but that our self-catering accommodation is so much more spacious than any hotel or B&B room and there are so many extras. We find that many of our guests have friends or family in the local area and our cottages with spacious living and dining rooms as well as outdoor dining facilities and braai/bbq fireplaces make it easy to entertain them. Children are not confined to a single room but can relax in the living room in front of the TV or have the freedom of running around in a secure acre of garden.